On Tuesday's episode of The View, Barry Manilow stopped by to promote his just-released duets album. 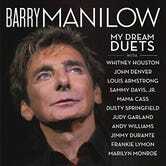 This album is very special; it's entirely tracks of Manilow performing with people who are dead. They asked me to do a duets album and I thought, 'how can I do my duets album different than everyone?' I picked all these people that I would have loved to sing with but they're all gone. So I did duets on this album with John Denver, Judy Garland, Whitney Houston, Louie Armstrong. I mean it's along list of famous, famous singers. And they've figured out a way of helping me make a beautiful album of these famous people singing famous songs. Thanks to the miracle of modern technology, Manilow isolated the vocal tracks of dead performers and worked them into his own new arrangements. You know it was really emotional hearing Whitney just by herself. You know, I had to push myself away from the speakers – [it felt like] she was standing right next to me. Really, I would sing with her, and then I would go for the Kleenex. This performance in particular was really something: Manilow sang in front of a video that was supposed to look like Whitney singing the song with him – you know, Tupac hologram-style. What it actually seemed to be was a video of another black woman, her face masked with shadow and light, as Whitney's vocal track playing. Really moving stuff, especially the end, when Manilow and "Whitney" blew each other a kiss.